Once you get there, you see that’s it’s heavily guarded, so Karen decides to try and sneak in while you distract the guard. Not the best plan as the guard is highly strung and Karen ends up disappearing. Great. As you search for Karen, you find yourself wrapped up in an otherworldly mystery that not only has you searching for her, but also has you saving souls with the help of a dark feathery friend. 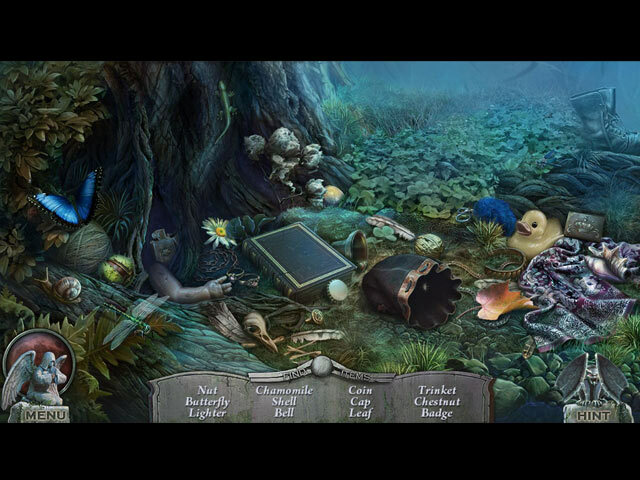 Things aren’t as they seem in this eerie cemetery – prepare yourself to be challenged in this hidden object mystery game! The graphics in this game are well done and work with the theme, which is dark and nightmarish. Colors are muted, as they should be, with grays and blues. What’s nice here are the colors that pop out against the darker palette, like yellow glowing eyes on some of the characters, or the glowing crimson eyes on the rabid bats you run into. Items you find, like gold tokens, are bright in the dark night. Music notes glow and float slowly around a musical instrument you discover. Characters look realistic and when there is a little light, you can see varying emotions flit across their faces as the drama unfolds. The ambiance is also well done – rain falls lightly at times, and adds to the imposing darkness. Gray statues stand with faces shrouded – one even holds a scythe. Wind howls softly in the background and you can hear crows cawing at different times. Each area you walk around in is strewn with dead undergrowth, tombstones, and skulls. Music plays softly in the background, like the background music in a horror flick, where the character is just about to walk into a trap. This is not done over the top. A lot of thought clearly went into this and this is what makes the game so fun to play. 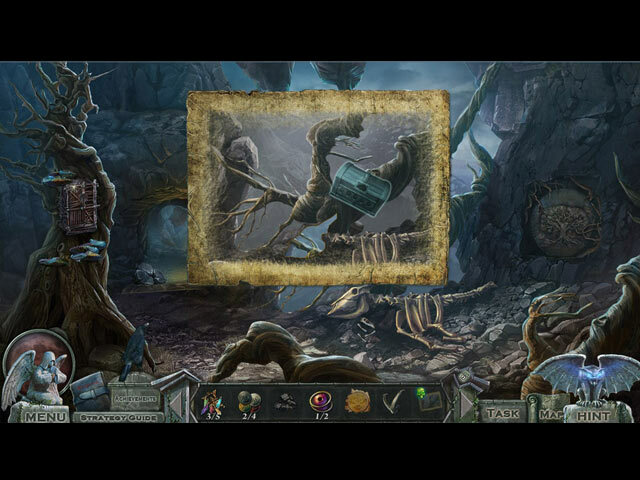 There are a fair amount of hidden object puzzles and creative games to play. There is also quite a bit of dialogue with characters you come across – if you’re a speedy reader you can go through it quickly. You also have choices to make – should you be aggressive and rush at a threatening character or should you be docile, and go the gentle route? If you choose to be more aggressive, your chaos meter goes up and you could be out of balance! Restore the order by making less aggressive choices. Some may think the dialogue and choice boxes may slow the game down a bit. You also have the help of a raven – this is great – your feathery side-kick can help you out when your choices are limited. 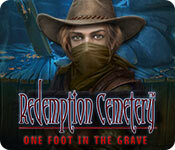 Redemption Cemetery: One Foot in the Grave is a great game to play. 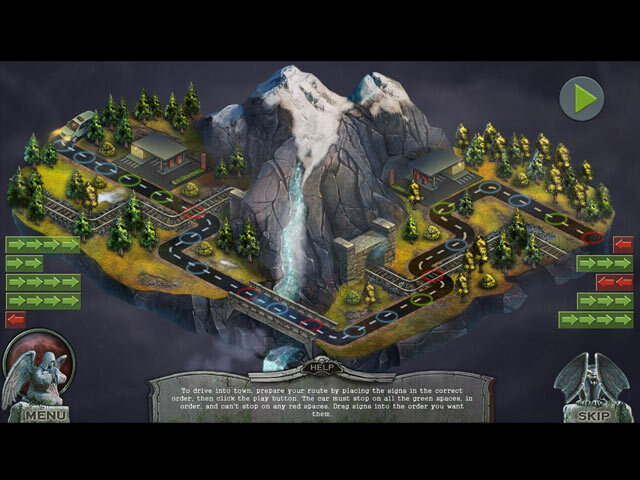 If you like the creepiness of a cemetery and all that goes alone with it – dark shadows, evil machinations, and deep mystery – then this is the game for you.